The Exerpeutic GOLD 525XLR and GOLD 975XBT are well-built entry-level recumbent exercise bikes for a relatively low price. Sturdily constructed, both the Exerpeutic GOLD 525XLR and GOLD 975XBT recumbent bikes support a high user weight capacity, with the 525XLR offering an extended user weight capacity of up to 400 lbs compared to the 975XBT’s 310 lb user weight capacity. The Exerpeutic GOLD 525XLR is more of a semi-recumbent bike with the advantage of a space-saving folding frame, while the Exerpeutic GOLD 975XBT is a full-recumbent bike with a step-thru frame design for easier mounting and dismounting. Both the Exerpeutic GOLD 525XLR and 975XBT Recumbent Bikes utilize a dual transmission drive system with their precision balanced flywheel and V-belt drive that combine to provide a smooth and quiet workout with magnetic resistance. 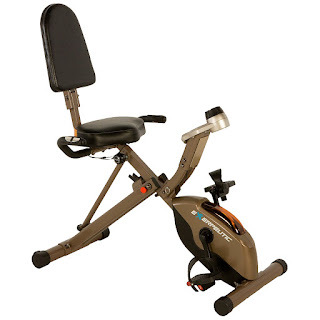 The Exerpeutic GOLD 975XBT Recumbent Bike comes with a more advanced console compared to the 525XLR. The 525XLR’s small monitor has a standard grey/black display with a turn-dial tension knob at the top to adjust its 8 levels of resistance. If you’re looking for basic training where you’re in control of your workout, this is perfect for you – you can adjust the intensity of your workout up/down as and when you wish. 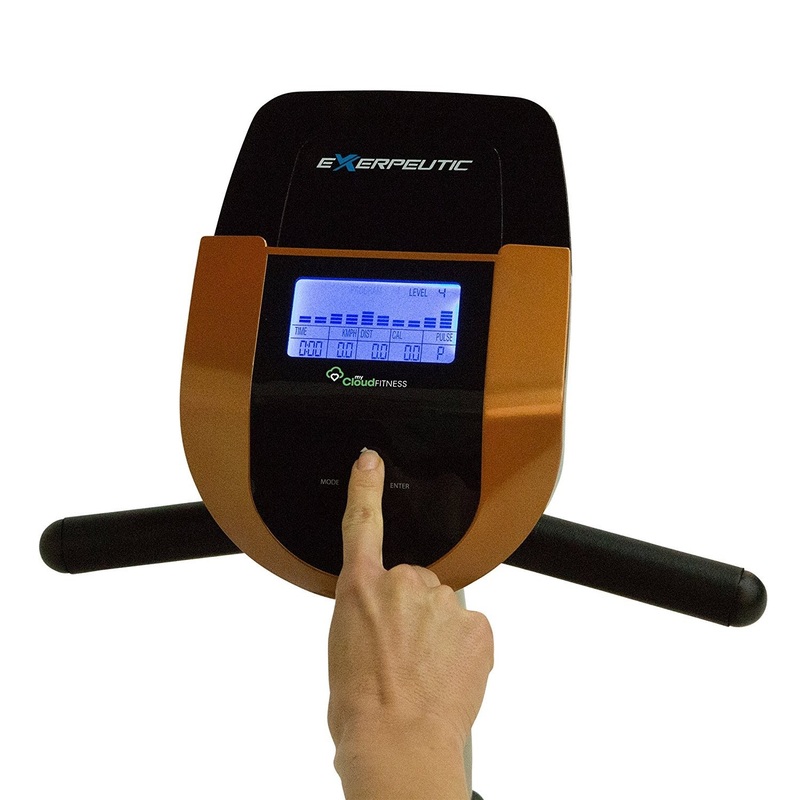 The 975XBT’s console is larger with a backlit display for easier viewing and offers 16 resistance levels, 21 pre-set programs, 2 user profiles as well as Bluetooth Smart Technology to sync with the free MyFitQuest4 app on your own mobile smart device. So if you’re looking for more of a challenge or like lots of variety in your training, then this is perfect for you. The Exerpeutic GOLD 975XBT’s console also features a built-in media shelf to place your tablet or mobile phone, and there’s also a handy water bottle holder built into the recumbent bike’s frame which the 525XLR doesn’t have. 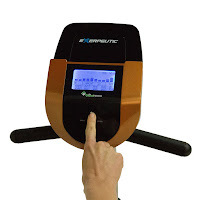 Both the Exerpeutic GOLD 525XLR and 975XBT’s monitors display motivating workout stats as you exercise including time, speed, distance, calories and pulse. 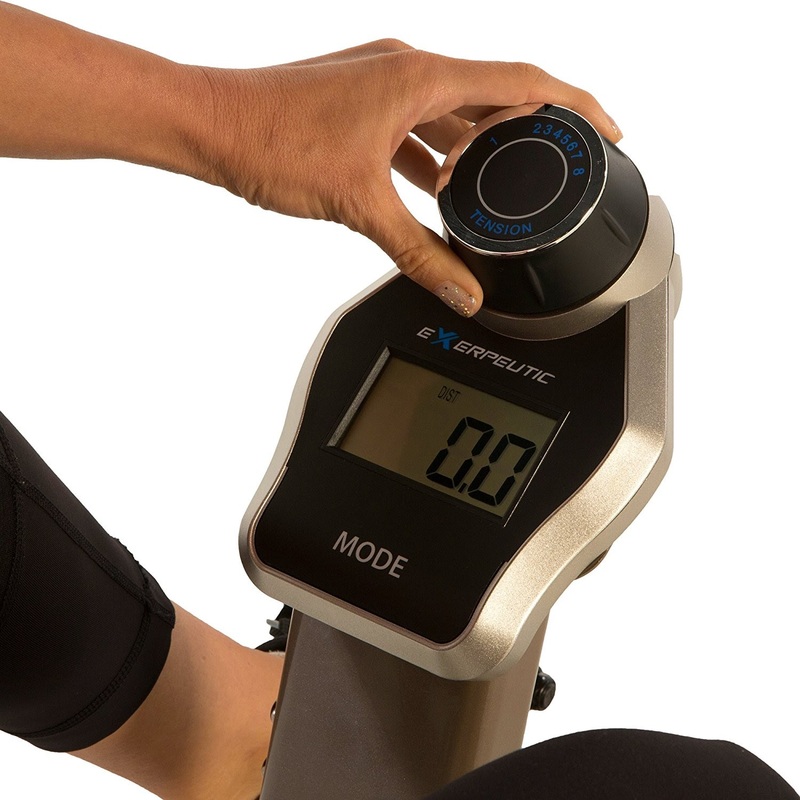 Both recumbent bikes feature contact pulse grip sensors in the handlebars at the side of the seat to monitor your pulse/heart-rate to help you stay within your target heart-rate zone as you cycle. The seat on both the Exerpeutic GOLD 525XLR and 975XBT Recumbent Bikes are padded for comfort and have a backrest for added support. 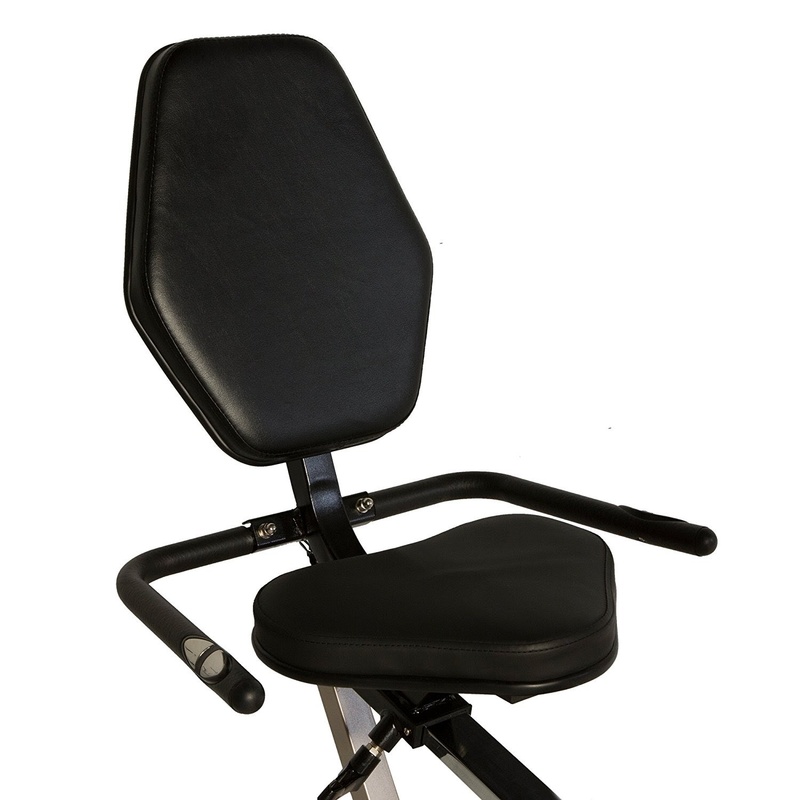 The 975XBT’s seat is larger than the 525XLR and sits on a sliding seat rail system for easy adjustment. The seat on the 525XLR is also adjustable but adjusts in a different way with a turn-knob (look closely at the pictures to see the differences). The 975XBT allows for a slightly wider user height range from 4ft 11” up to 6ft 6” tall compared to the 525XLR’s 5ft 2” up to 6ft 5” tall height range. 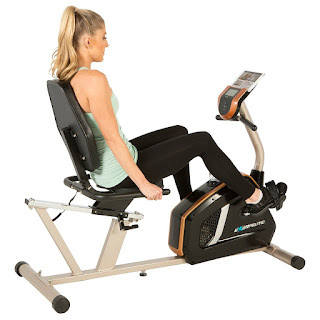 Both the Exerpeutic GOLD 525XLR and 975XBT Recumbent Exercise Bikes feature large pedals with adjustable safety straps for secure foot placement and extended leg stabilizers for added stability and to prevent movement/tipping while exercising. Both recumbent bikes also feature transport wheels for easy relocation (front-mounted on the 975XBT and rear-mounted on the 525XLR). As previously mentioned, the Exerpeutic GOLD 525XLR has a folding frame which the 975XBT doesn’t have, and allows for easy storage. Fitness tip: Cycling for just 30 minutes could burn between 207-345 calories for women, or 252-420 calories for men, depending on the intensity of the workout. The Exerpeutic GOLD 525XLR and GOLD 975XBT are impressive entry-level recumbent exercise bikes for the money. Both are sturdily constructed and operate smoothly and quietly so you can watch TV or listen to music as you exercise without having to turn the sound up! With its folding design, the Exerpeutic GOLD 525XLR Semi-Recumbent Bike is ideal for homes where space is limited. If you’re looking for an exercise bike that you can just get on and go, this is the one for you. There are no workout programs to figure out – simply turn the tension dial to adjust the intensity for a harder or easier workout. If you’re the sort of person who gets bored easily or wants more of a challenge, then the Exerpeutic GOLD 975XBT Recumbent Bike is the one for you. It offers a great variety of workout programs and resistance levels to keep you motivated and it even has Bluetooth connectivity for online fitness tracking if that’s important to you. The 975XBT is more of a true recumbent bike with its step-thru frame design which makes it easier to mount and dismount the seat compared to the 525XLR. One other point to bear in mind is the difference between how the console/monitor is powered on these two recumbent bikes. The 525XLR’s monitor is powered by batteries which means that you can place the bike anywhere without having to worry about it being near a wall-socket, whereas the 975XBT’s monitor is electric powered so will need to be placed near a wall-socket but at least you’ll never have to worry about replacing batteries on this one! Comparing Nautilus MY18 R618 versus Nautilus MY18 R616 Recumbent Bike, What's the Difference? Comparing Nautilus R616 versus Nautilus R614 Recumbent Exercise Bike, What's the Difference? Comparing Bladez Fitness R300 versus Bladez Fitness R500i Recumbent Bike, What's the Difference? Comparing Lifecore Fitness 1060RB versus Lifecore Fitness 860RB Recumbent Exercise Bikes, What's the Difference?